The PDF document format is very widespread due to the options that it offers when it comes to printing a document, because what you see is what will be printed, and the fact that the documents in this format can't be edited, provides them with protection. 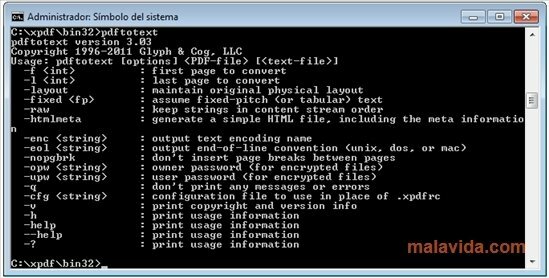 To be able to see these files via the command line terminal, it's necessary to have an application like Xpdf. Xpdf doesn't require any installations, thus making it the perfect PDF viewer to be able to take it with you wherever you go on a USB pendrive. All you will have to do is access the command line terminal and make sure that you have the control file in the folder indicated by the application. Therefore, if you want to have a practical PDF file viewer on your computer and to be able to take it wherever you go, you only have to download Xpdf to your PC.